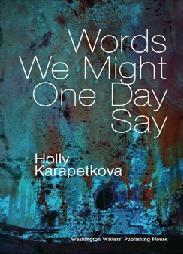 Holly Karapetkova is the author of Words We Might One Day Say (Washington Writers’ Publishing House, 2010). She is the author of over twenty books and graphic stories for children and young adults. Karapetkova’s poetry, prose, and translations from the Bulgarian have appeared in Mid-American Review, 32 Poems, and Huffington Post. She is an Associate Professor of English at Marymount University and lives in Arlington, VA.